This is the third of a multi-part sermon series on the Book of Exodus. In this sermon, Dr. Thiel begins with the eighth chapter and covers all of the verses through the end of the ninth chapter. He discusses the plagues of frogs, lice, swarms, pestilences, and hail. He connects these plagues with various gods and goddesses of Egypt to point out that God was demonstrating to the Egyptians that their gods could not protect them, gods like Heqet (frogs), Geb (lice and boils), Amon-Ra (swarms), Neith (swarms), Apis (animal pestilence), Hathor (animal pestilence), Nut (hail), Shu (hail), Isis (hail), Seth (hail), etc. He also mentions come ancient historical documents that support the biblical account. He shows how God admonishes people not to lie or break their word like Pharaoh did. Dr. Thiel tied various plagues of Egypt in with prophesied plagues in the Book of Revelation. He also tied in several of the plagues with other parts of the New Testament and explained the relevance of these matters to Christians today. Here is a link to the sermon: Exodus 8-9: Plagues and Prophecy. 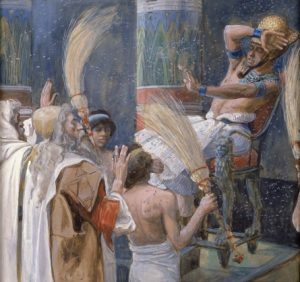 Exodus and the Days of Unleavened Bread This article discusses the early chapters in the Book of Exodus, as well as some connections to the New Testament and Days of Unleavened Bread. Additional sermons include Exodus 1-4: Jewish Myths or Lessons for Christians Today?, Exodus 5-7: Serpents, Blood, and Revelation, and Exodus 8-9: Plagues and Prophecy.. This entry was posted on Saturday, March 10th, 2018 at 12:01 am	and is filed under COG News, Old Testament History, Prophecy.